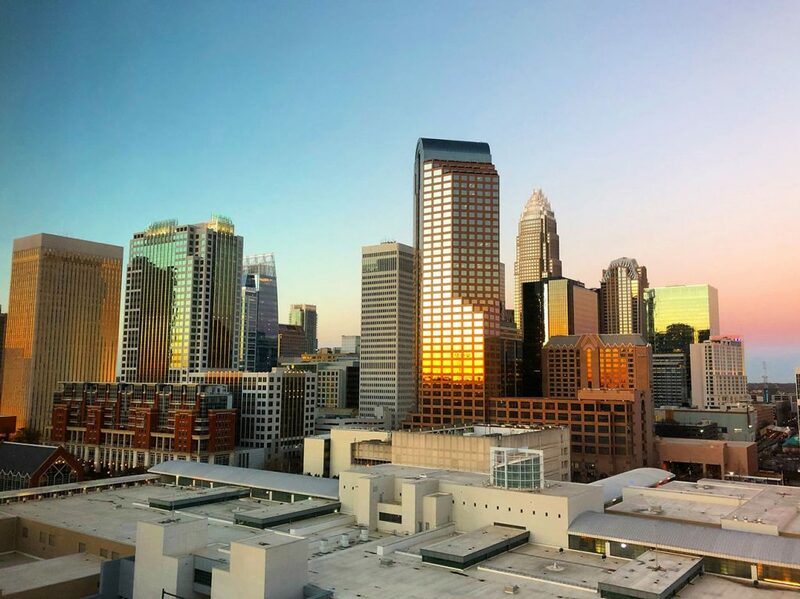 Charlotte is growing at a breakneck pace, there’s no question about it, and that can be seen riding around South End counting all the cranes hovering over our newest apartment buildings. A lot of these buildings are pretty similar to one another, but here are four apartment projects will offer something different than the rest. Named after the inventor of Pepsi Cola, Caleb Bradham, Bradham at New Bern Station will feature 423 one, two and three bedroom units. It’ll feature ample retail space and a ton of open space along the Rail Trail for residents and the public to utilize. Location: Corner of New Bern and South Tryon — on the site of the former Pepsi Bottling Plant. It’s within a hundred yards of Suffolk Punch. Timing: Late May, Early June 2019. Prospective tenants can register at BradhamNewBern.com to get more information and join the VIP list, to stay abreast of upcoming pre-opening events. Retail: Our favorite aspect of Bradham is the 25,o000 square feet of retail. Confirmed retail tenants include Link & Pin, Eight & Sand and Great Clips. Future retail mix could include a high-end nail salon, fitness concept and two more food and beverage options. Apartment amenities: Keyless entry, townhome floor plans available, spacious walk-in closets, custom tile back splash, quartz countertops, stainless steel appliances, full-size front-loading washer and dryer, under cabinet lighting and soft close drawers. Community amenities: It’ll have a dog park and spa, saltwater pool with cabanas, fitness workshop with yoga room, club and game room, private work pods, package concierge, outdoor kitchen, transit lounge with direct access to the Rail Trail and light rail televised train schedule. And it’s 100 percent smoke-free. Design: The side of the apartment building facing the Blue Line is designed to embrace New Bern Station and the Rail Trail. Not only will it feature a large plaza for residents, but there will also be plenty of space for the public, including Eight & Sand, a concept you should be very excited about, which will have roll-up doors, and a large patio opening up to the light rail station. When Edens, a national retail developer, purchased Atherton Mill in 2007, they had big plans for what they felt could be the new center of gravity for South End. Fast forward twelve years later and that vision is coming together in the form of a massive retail complex, topped by 346 apartments, being developed by Crescent Communities. Location: On the grounds of the historic Atherton Mill, on the corner of South Blvd and West Tremont, right along the light rail. Timing: Construction is wrapping up and they’ll be leasing this summer. Convenience: Almost everything you could possibly need is at your doorstep. When complete, Atherton Mill will feature nearly 30 retail spaces, taking up 115,000 square feet of dining, entertainment, and shopping space. Need groceries? Walk down the block to Publix. Looking for a bar stool to pull up to your new kitchen island? Head over to West Elm. Having a girls weekend in Hilton Head this weekend? Head to Las Olas for a bathing suit, and Warby Parker for some new glasses. If you want the experience of convenient, big city living, this is the place for you. Future New Light Rail Station: Currently CATS, the city and local stakeholders are discussing the addition of an at-grade crossing aligned with Atherton. 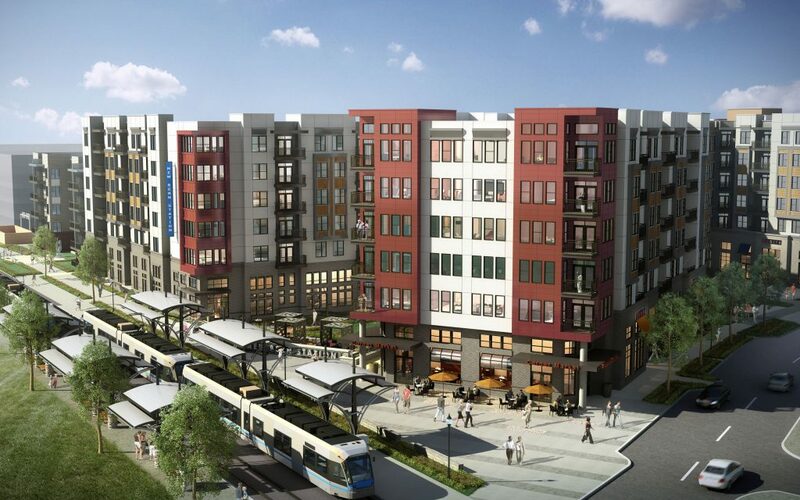 Future plans are to add a new Blue Line Station to serve this development and the growing population around it. Incredible Rail Trail Frontage: The Rail Trail will filter directly through Atherton Mill on the backside of Novel. Shops and Restaurants will face toward the trail, and there will be incredible public gathering spaces for farmers markets, small concerts and tons of activities for residents and the general public. 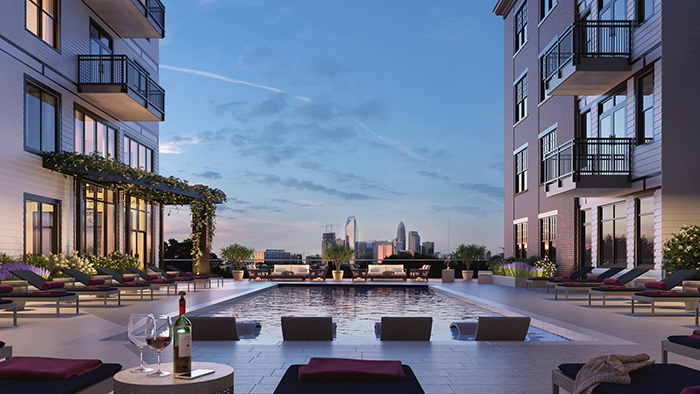 These days South End apartments are known for their resort-style amenities. But Centro Railyard, which consists of 91 Units – a mix of 400-square-foot studios and 800-square-foot unit two-bedrooms corner units – looks to buck that trend and provide renters a space to live, without the up-charge for all the frills. Timing: Centro Cityworks, the developer, has set an ambitious completion date of late 2019 or early 2020. Concrete has been poured for the first floor, and four floors of wood framing will proceed afterward. Location: Winnifred between West Bland Street. and Winona Street, a block away from Wooden Robot South End. 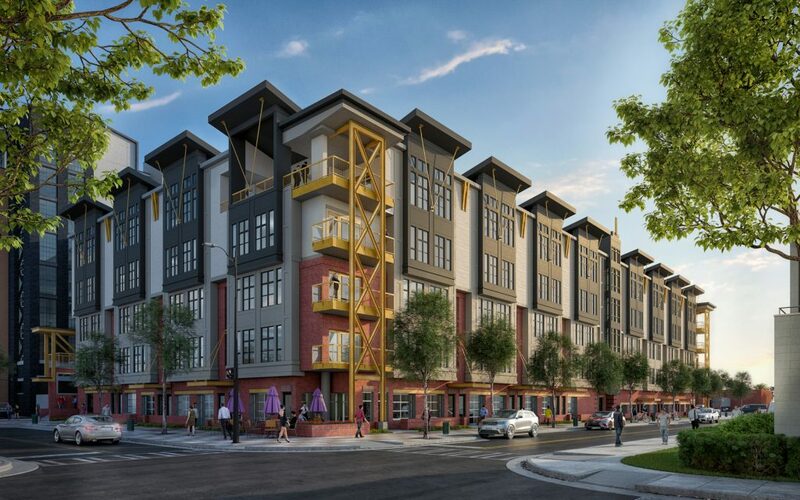 These apartments will be built surrounding the parking deck for the RailYard. 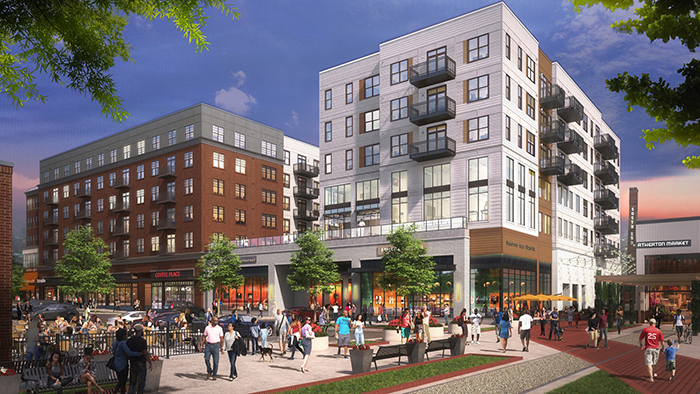 No frills: Centro RailYard is not your prototypical Charlotte apartment development. It has smaller-than-average units and focuses on proximity as an amenity, instead of splashy amenities like dog wash stations and saltwater pools. Don’t forget: Rooftop space with amazing views of Uptown. 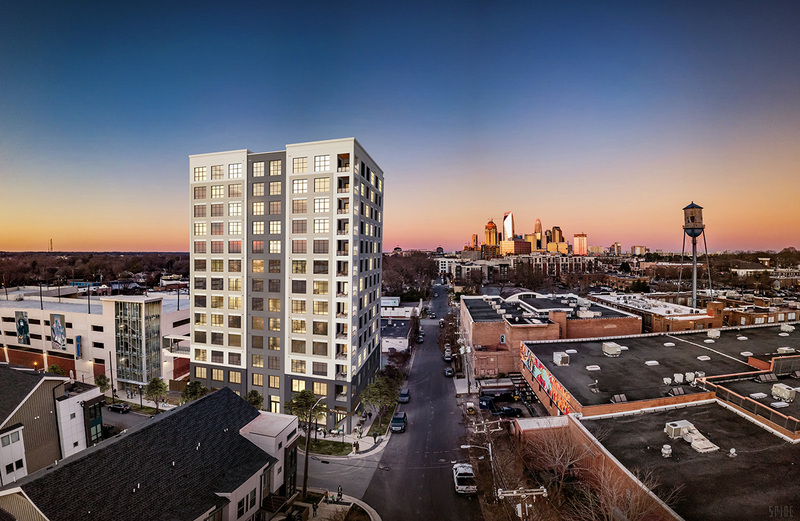 A 13-story, 71-unit apartment tower named “Hawk” is coming to South End right next door to Superica, Barcelona Wine Bar, Hawkers and Jeni’s Ice Cream. 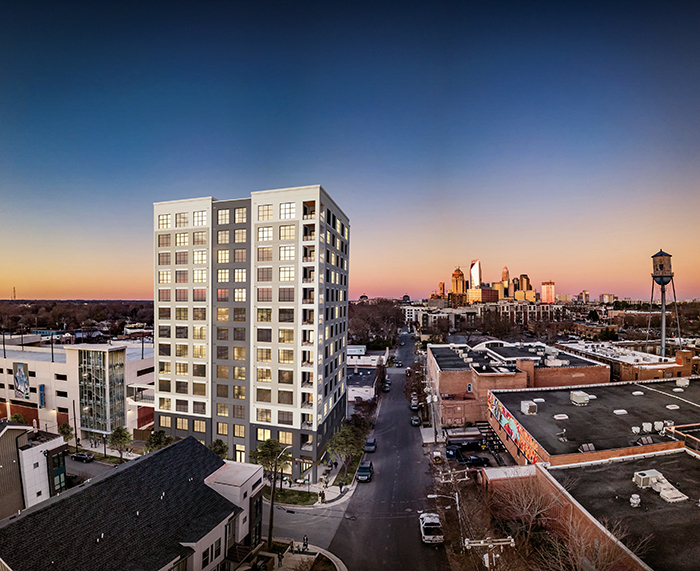 Timing: Ram Realty Advisors, the development company behind the project, will soon break ground on the project, with a grand opening set for the summer of 2020. No noise: Precast concrete construction means you might not hear your noisy neighbor. Hawk aims to be an apartment building where residents can come home, escape their lives, and have a private night at home. Finishes: Luxury is a word thrown out by everyone these days, but this building truly embodies that experience. The units will have beautiful wide-plank flooring reminiscent of European oak and expansive warehouse-style windows. 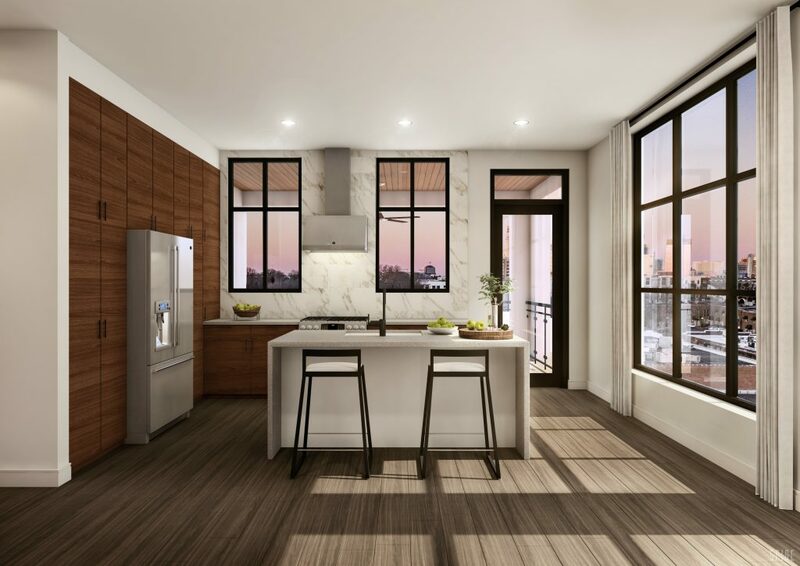 Kitchens include state of the art French-door refrigerators, gas ranges, custom walnut cabinetry, brass and black hardware and quartz countertops. The bathrooms will have luxurious freestanding soaking tubs and even a separate toilet room. Condo conversion: Units are built to be convertible to condos, should the market allow at a later date. Units: Unit options will include studios, two-bedroom and three-bedroom layouts. Additionally, the project will have a pedestrian bridge so residents can utilize the adjacent parking deck. Which apartment community do you want to live in?